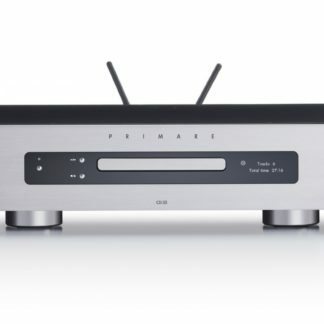 Primare CD35 is uniquely versatile, available in three different configurations: an all-in-one CD Player/streamer or a CD Player with 32bit ESS SabreDAC, or a dedicated CD Transport. 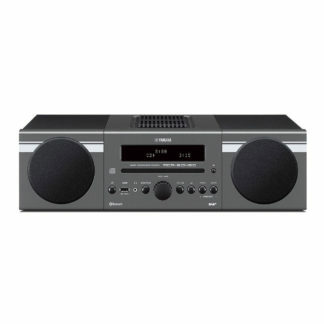 SKU: N/A Categories: A - P, Brands, Compact Disc, Electronics, Primare AB Tags: 24k Gold, Audiophile, European Quality, Fashion forward, Hi-Res Audio, High End, Internet Radio, iPod Connectivity, NextGen Product, Primare, Wow! 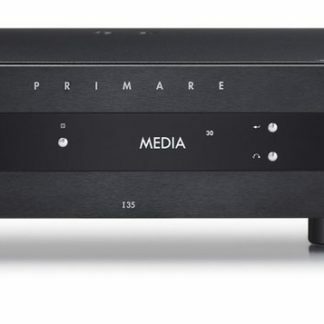 Primare’s CD35 PRISMA CD player combines a state-of-the-art CD drive, all-new reference balanced DAC stage, feeding a finely tuned balanced analogue output stage. 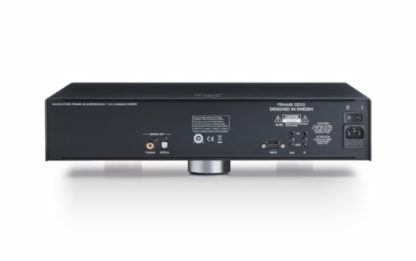 Each component of the CD35 Prisma design – the drive, the DAC, and the output stage – contributes to what is the best CD player Primare has ever offered. 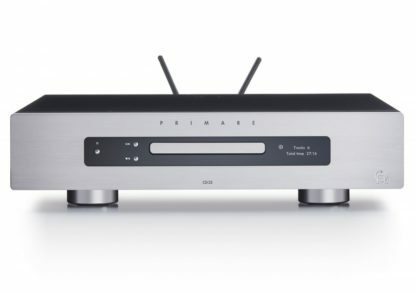 Designed to meet three distinct briefs; it makes sense that Primare CD35 is available in three configurations: a meticulously constructed dedicated CD transport and a CD player and CD player/media streamer that features ESS’ ES9028PRO SABRE digital-to-analog converter (DAC) and carefully designed Primare power supplies. At the centre of the CD35 design is the DD35 CD transport. Enclosed in Primare’s famous resonance-control case, is two discrete power supplies: a transformer based linear supply for CD playback and a switch mode supply for standby function. 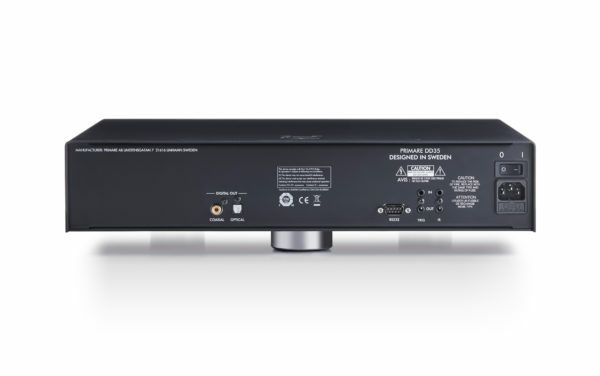 Primare selected a premium TEAC dedicated audio transport – the CD 5020A-AT – because it is a dedicated CD drive with excellent adjustment facilities and low clamp noise. 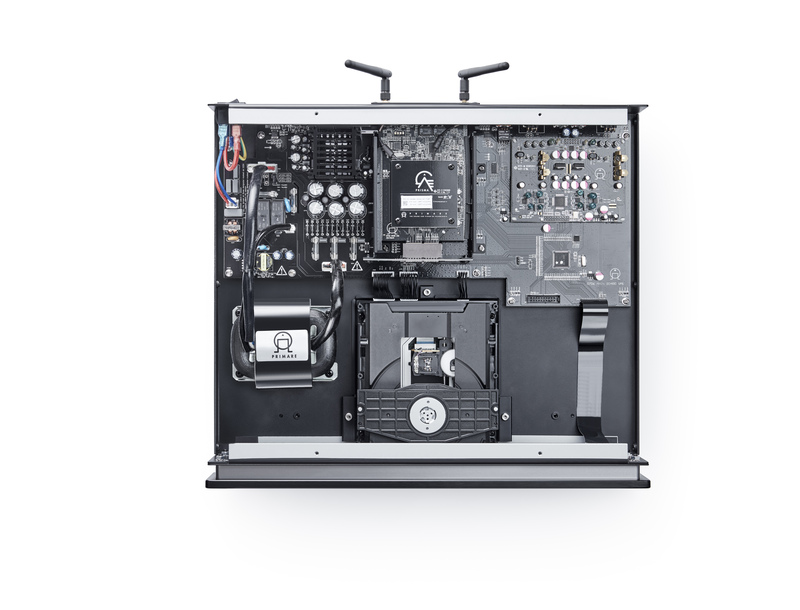 The drive ‘floats’ on a custom isolation platform within the CD chassis itself to separate it from speaker vibration and separate internal audio components from its movement. An oversize audio-grade transformer provides ultra-low-noise power for the audio circuitry, while a switch mode power supply looks after the transport when the DD35 is in standby mode. The switch mode power supply switches off when the device is switched on to eliminate power ripple interference. Don’t believe everything you read – well, the first time, anyway. 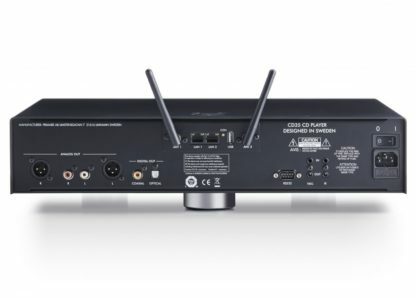 To eliminate jitter and data errors, DD35 employs a memory buffer which temporarily stores data from the TEAC drive before it’s output through SPDIF coaxial (RCA) or optical (Toslink) connectors. As a result, the data bitstream, output from the DD35 CD transport, is perfectly organised into ‘ones and zeroes’ without significant timing error. A beautiful black or titanium anodised aluminium accents the front plate, with gloss OLED display window, stainless steel controls and an engraved company logo. CD35 exemplifies pride in Primare craftsmanship and attention to detail at first glance. Throughout the x5 range, Primare uses the wonderful AKM 32bit digital-to-analogue converter DAC. But the CD35 PRISMA employs an altogether different beast. The state-of-the-art ESS ES9028PRO SABRE DAC is a 32-bit, 8-channel PRO series DAC and it’s based on their patented HyperStreamDAC technology. With Primare’s meticulous four-layer circuitry and bespoke power supplies, it has outstanding performance specifications with 129dB dynamic range and -120dB total harmonic distortion plus noise. The ESS SABRE DAC operates in a balanced D/A conversion scheme that feeds discrete analogue output stages with a hand-selected FET input section. 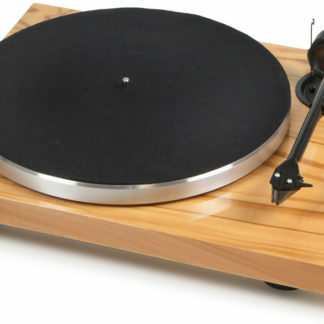 The result is a smooth, spacious rendition of the soundstage. The ‘SABRE DAC has an uncanny ability to reproduce melody and ‘musicality’ of instruments and present them independently within a soundscape. Matched With A Primare Amplifier, The Choice Of DAC Is Yours. Despite similar specifications, there are significant differences between the listening experience delivered by SABRE DAC and the AKM VERITA DAC. The ESS DAC produces tuneful, spacious sound. It seems to be better at unravelling busy, muddy mixes than the AKM. The AKM VERITA DAC generates a more visceral punch, a more forward soundstage, an altogether more exciting, gutsy, ‘bassy’ presentation. 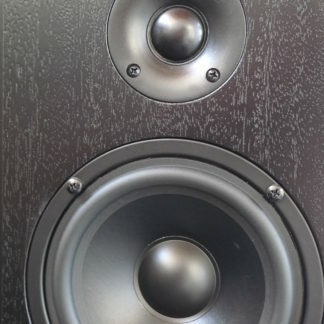 They’re both 32bit balanced configured DACs – the AKM has a higher dynamic range and is capable of decoding higher-spec file types – the ESS has lower harmonic distortion and noise. Within an all-Primare system, the choice is yours. Primare amplifiers are available with and without digital electronics built-in. If your preference is for the AKM VERITA DAC, then match a DD35 transport to any Primare Ix5 PRISMA or Ix5 DAC integrated amplifier and enjoy the sound characteristic that suits you. If you prefer the ESS SABRE DAC, then you would pair the CD35 or CD35 PRISMA to Primare’s I15, I25 or I35 analogue input amplifiers. Or, if you like to experiment (like me), combine an Ix5 DAC or Ix5 PRISMA amplifier with the CD35 PRISMA and choose for yourself ‘on the fly’ depending on how you feel at the time. It’s only money! Is any other CD-based system so versatile?! Two and four-layer double-sided circuit board construction allows for the most direct and efficient layout of components. Not only does this achieve the shortest signal path, but also optimises a design of circuit and subcircuit components for best performance. Primare employs Surface mount technology (SMT) whenever possible. SMT components allow direct connection of the circuit device or component to the circuit board with the solder being used solely to hold the part in place mechanically. Metal wires, at each connection point in a conventional circuit, all add up; so eliminating them with high-spec SMT components and devices significantly shortens the signal path. In addition, conventional through-hole construction limits direct contact of the component to the circuit board and results in the solder providing the electrical connection as well as the mechanical connection for the device. Neither the solder nor the metal leads of most through-hole components is ideal for signal transmission and therefore compromises the potential performance of even the best-designed circuits. Resonance control through heavy-gauge metal chassis’ has a profound effect on the Primare sound. Primare metal chassis’ are of complex construction with as few independent elements as possible. Each component braces and strengthens its adjoining components. Voids in the powder-coatings and paints ensure metal-to-metal contact so that the whole chassis is grounded electrically and mechanically. All chassis components are made from selected metal alloys, powder-coated steel or aluminium. The casework assembly then sits on three solid alloy feet with critical damping/isolation mats – three feet ensures even distribution of pressure and lower resonance than four. The whole assembly weighs in at approximately ten kilograms! And, What Was PRISMA, Agan? PRISMA refers to Primare’s proprietary media technology. PRISMA technology allows audiophile level Google Chromecast, Apple AirPlay2 and Spotify Connect streaming from any networked device to your Primare PRISMA integrated amplifier, pre-amplifier or CD player. A proprietary PRISMA iPad app navigates music stored on your networked hard disk drives. 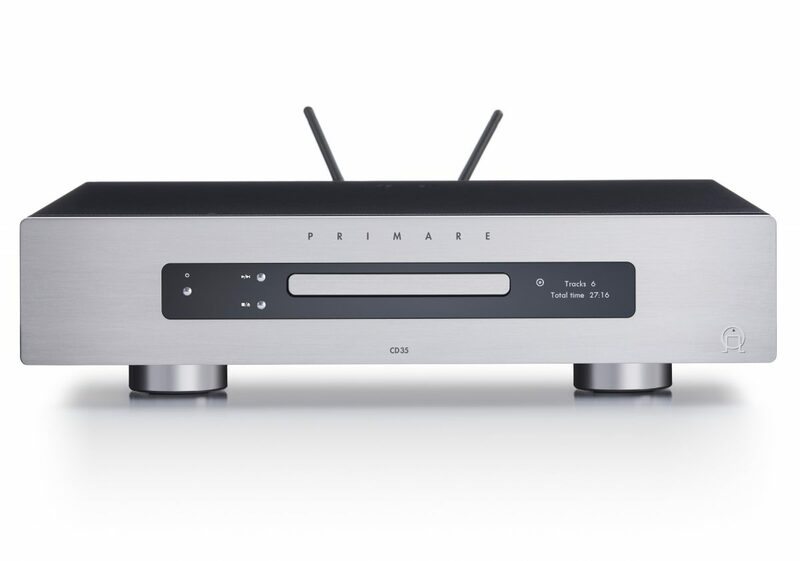 CD35 PRISMA is the fully-featured networked-streaming version of a family of three Primare disc players. 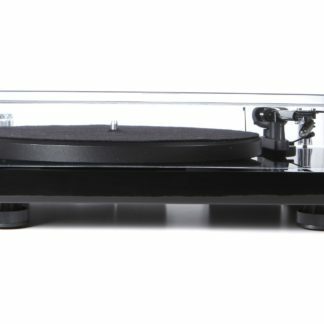 CD35 is a DD35 transport with ES9028PRO SABRE DAC, optical, RCA digital outputs and RCA or XLR balanced analogue outputs. 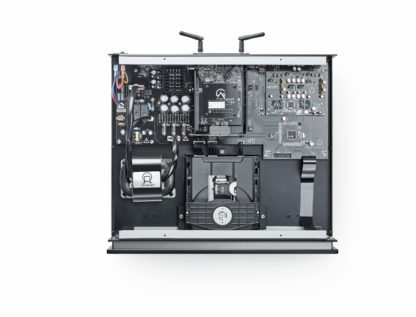 CD35 can be simply upgraded to a CD35 PRISMA at home with a PRISMA module and a screwdriver. DD35 is the dedicated audio transport of a CD35.